Gilia is a wildflower native to the western United States. Perfect for seeding in naturalized meadow-like plantings, they come in a wide range of colors and are an important part of native ecosystems. 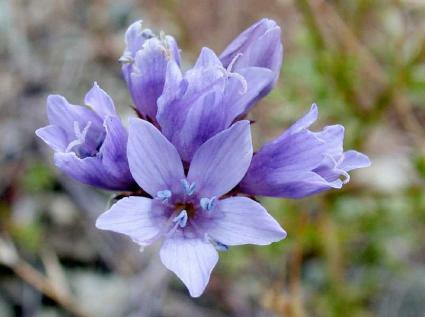 There are a number of species of gilia, though they all share a few common characteristics. They grow best in moderately dry, well-drained soils. They are spring-bloomers grown primarily for their flowers which are borne on upright stems. The foliage stays low to the ground and often shrivels up in the heat of summer. Most are grown as annuals, though some are biennials, meaning they form leaves in their first year and flower in the second, after which they set seed and die. 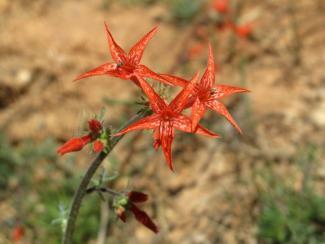 Scarlet Gilia, also called skyrocket, is a biennial variety with two-inch red or orange tubular flowers atop three foot stalks and makes an excellent hummingbird plant. Birdseye Gilia forms an 18-inch high carpet of multi-hued blue-violet-white flowers with a sweet scent; it's great in large swaths. Blue Thimble Gilia has light blue pom-pom style flowers, also scented, that grow on short, leafy stalks about 12 to 18 inches tall. It is very attractive to hummingbirds. There are numerous other similar, but more obscure, native gilia species, though these three are the most commonly seen in seed catalogs and wildflower mixes. These plants are uncommon in nurseries, so more than likely, you'll be starting them by seed. Rather than sowing them in pots, they are typically sown directly in the area where they will grow. Consider combining them with the seed of native grasses, such as California fescue, and other western wildflowers like California poppy, sky lupine, penstemon, and sticky monkey flower. The planting area should be tilled and existing vegetation removed before sowing gilia seed. There is no need to add compost or other amendments; it is more important to focus on removing other vegetation that will compete with the seedlings. Fall or early spring is the best time to sow gilia seed. Because the seeds are so tiny, it's best to mix them evenly in a bucket of sand and then sprinkle the mixture over the planting area. Wait for rain to make the seeds germinate or use a sprinkler to get them started. After they are a few inches tall, water sparingly to avoid overwhelming them with excessive moisture. As the season heats up, you can irrigate periodically with a sprinkler whenever the top three or four inches of soil becomes dry. If the environment is suitable, gilia will reseed itself each season as part of a permanent wildflower meadow. 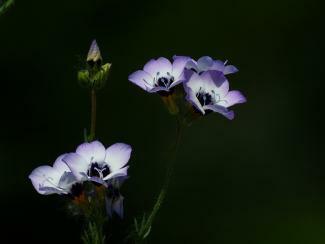 As a native wildflower, gilia doesn't have trouble with pests and disease like most garden plants. Gilia is a not a plant that is typically grown by itself, but it is a wonderful ingredient in wildflower gardens, where different species come and go at different times of year. Consider it for its color, diverse flower form, and the habitat is provides for native birds and insects.